Good ole Google.fr! 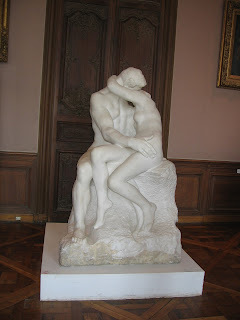 I love that it reminds me of important events...like Auguste Rodin's birthday. Born on this date in 1840, Rodin is considered the father of modern sculpture. 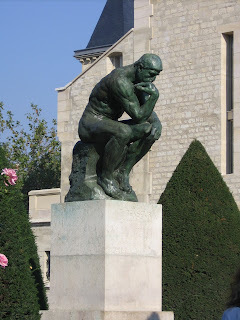 I dug through my photo archives and found this one of 'The Thinker' that I took on my very first trip to Paris in 2005. Rodin and his mistress, Camille Claudel, are two of my friend, Marie's favorites so a visit to the Musee Rodin was at the top of our 'to do' list. As we strolled through this lovely house showcasing Rodin's creations, we played our game of 'if you had all the money in the world, which piece of art would you buy?' There were a few of Camille's pieces on display (the rest were 'traveling' and on display in another country) While Rodin's works were beautiful, my favorites were actually Camille's. I would buy one of hers, I think. They seemed more organic and real to me, dare I say....more tortured?? Much like she was at the end of her life. Unfortunately, I didn't take any photos of the few pieces of Camille's work on display. I was more intrigued then by Rodin's work. I'd never been a big fan of sculpture until that first trip to Paris. I'm convinced that sculpture is something best appreciated in person. Photos do not do it justice.